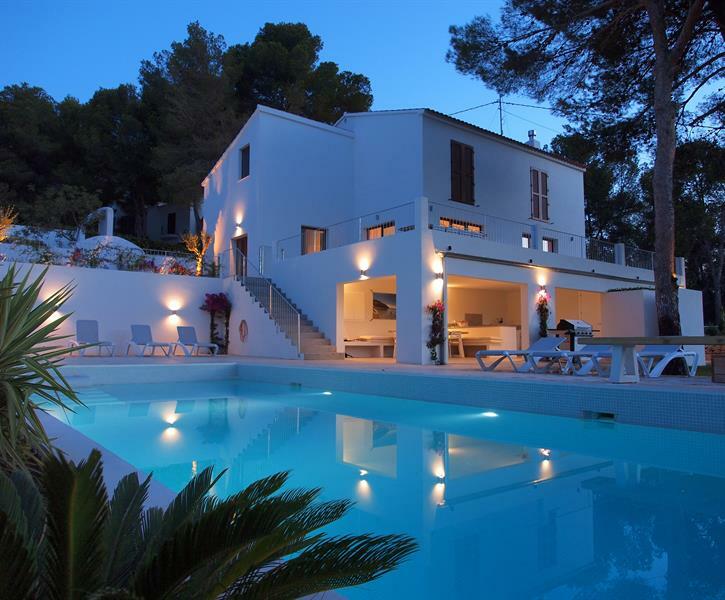 Unbeable location: Very Luxurious Villa 500m to beach; 900m to Moraira. 5 BR, 4 Bath; Full Airco, 2 kitchens, BBQ, Nice garden, Big Pool; Absolute Privacy!. We were an extended family of 4 generations from 18 months to 85 yrs. we had a great time here. The villa is well equipped and really well thought out for young families with lots of areas that could be shut off eg upstairs to downstairs, the verandah/nayah could be closed off from the steps down to the pool. Very easy to walk to the beach and it was lovely to arrive on our first evening and head straight down to the sea front at el Portet and eat right on the beach front with the sun setting and the gentle wash of the waves. I would highly recommend the villa both for its location and the quality of the villa itself. Our family of 8; old and young spent a lovely week in this clean, well fitted, modern villa that had more than enough space for us all plus lots more. We were impressed with all the facilities, everything was clean and in great working order and we cannot recommend enough, owners were polite, helpful and communicated well. In fact when the bbq run out of gas, the owners sorted this out straight away, going over and above to help once contacted to ensure our stay wasn’t disturbed in any way. Highly recommended, fabulous villa to stay in, lovely location very close to beach, local shop and restaurants and a short walk to the local town. Very nice, new house in quiet area of Moraira. Nice furnished and well equiped. Very friendly and helpfull owner. We spent a week in Villa renate and it fully lived up to expectations. Modern, functional and clean. Very close to the beach and The town.